During the month of February, hundreds of thousands of Haitians took to the streets to demonstrate in response to the horrific economic crisis sweeping the Caribbean nation.For ten straight days, workplaces, schools and normal business activity were shut down when a coalition of opposition parties and community organisations engaged in a general strike. In recent months Haitians have suffered the consequences of a declining value of the national currency (gourde) making it almost impossible to purchase food and other consumer goods amid a 15 percent inflation rate. Allegations of widespread government corruption and the country’s on-going subordinate position within the world capitalist system has resulted in an US$89.6 million budget deficit. Security forces seeking to restrain the masses in their justified discontent led to violence involving extensive property damage. Anger erupted in early February prompting thousands of people to hurl rocks at security forces, blockading streets with burning tires and the carrying out of brazen attacks on police stations.During the first few days of the rebellion, there were at least 36 arrests, the deaths of two people and the injuring of police. 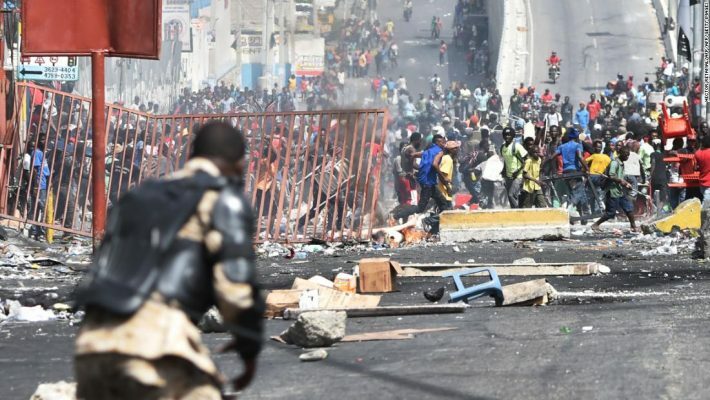 This recent unrest was the third of its kind within a span of four months.These events have led to the recent censure of the current government led by Prime Minister Jean Henry Céant. President Jovenal Moïse had appointed Céant and the cabinet six months earlier with a mandate to take corrective measures aimed at improving the economy, which is dependent upon usurious loans under restrictive conditions imposed by financial institutions and agencies dominated by imperialism.The only alternative being proposed by the western-backed politicians is more of the same neo-colonial oriented policies. Haiti, which has been sanctioned, attacked and vilified since its successful revolution of the enslaved Africans extending from 1791 to 1804, has been exploited by multi-national corporations along with being subjected to numerous military interventions by the United States, France, Canada and the United Nations. Charles in the same above-mentioned article emphasises to the readers: “The European Union, Inter-American Development Bank and World Bank had also agreed to provide an additional US$60 million in assistance before the start of the 1 June hurricane season. That US$100 million in aid disbursement is now dependent on how quickly lawmakers can agree on the next prime minister, which will be Moïse’s third since taking office in February 2017.” The Haitian Senate voted 93-6 to terminate the current administration. President Moïse has a limited window of time to appoint another prime minister and cabinet. A significant aspect of the contemporary discord is related to the apparent mismanagement of a US$2 billion fund from the Bolivarian Republic of Venezuela oil assistance programme allocated under PetroCaribe. Thousands of protesters have demanded the removal of Moïse, who has shirked responsibility for the escalating problems after days of demonstrations, blaming Céant for the difficulties facing the nation. During the time frame of 1804 and 1862, the United States government refused to even diplomatically recognise Haiti. Only after the disastrous first two years of the Civil War when the administration of President Abraham Lincoln developed plans for the possible evacuation of the capital of Washington, DC, did the Union Army realise it was necessary to recruit Africans as soldiers into the Northern military, along with issuing an Emancipation Proclamation, ostensibly freeing enslaved Africans in the Confederate rebel states. It is within this historical context that the United States exchanged diplomats with Haiti. Since the Civil War there have been numerous attempts to recolonise the country. For 19 years (1915-1934), Haiti was occupied by the United States, which imposed Jim Crow laws including the wilful lynching of Black people. Successive national dictatorships including Francois (Papa Doc) and Jean-Claude (Baby Doc) Duvalier in the mid-to-late 20th century were propped up by United States imperialism and its allies. February represented the 33rd anniversary of the mass uprising, which led to the overthrow of the Baby Doc Duvalier in February 1986. When Haitians elected the people’s candidate Jean-Bertrand Aristide for the first time in 1991 and later after being taken back into the country by the United States Marines in 1994, right-wing military coups were engineered in an effort to maintain foreign hegemony from Washington. As Haiti was celebrating the bicentennial of its founding in 2004, another counter-revolution was organised and ensured through the invasion of thousands of United States, Canadian and French troops. Fanmi Lavalas party work suffered repression while Aristide was kidnapped by the North Atlantic Treaty Organisation forces and taken illegally to the Central African Republic. Only a campaign of worldwide outrage created the conditions for the ousted president to gain political asylum in the Republic of South Africa under an African National Congress government.